Arch number 3 two years on from NT2573 : New Waverley and 'Work in Progress Edinburgh'. 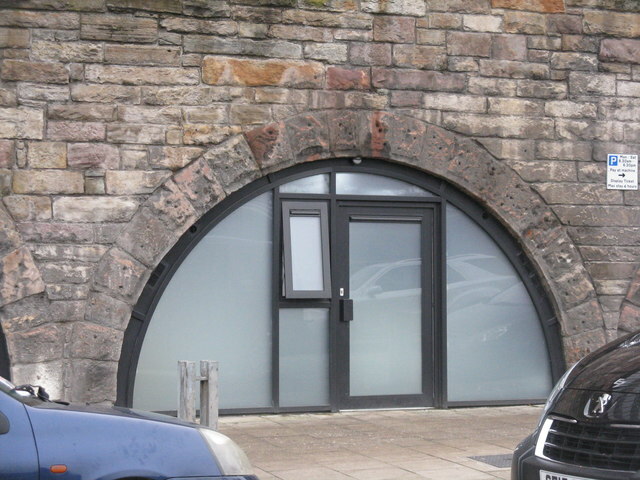 The arches under the supporting stonework of Jeffrey Street, as it climbs away from East Market Street, dating from 1875, have been redeveloped for retail use. Before the redevelopment began the doors of the spaces under the arches were available for public art - see the images from November 2014. Two years later the area was revisited to provide before and after comparisons - unfortunately, with redevelopment comes parked vehicles - see the November 2016 images. A. Because it was traditionally kept five minutes fast to encourage travellers to be on time for their (North British) trains at nearby Waverley station.